Opening weekend $15.115 million on 3255 screens. By my (possibly erroneous) count, 2002 offered the theatrical release of 15 different sequels. As I write this, The Lord of the Rings: The Two Towers won’t hit screens for another week. The last of the year’s big sequels, I think it’ll do very well, but I guess we’ll have to wait and see. Otherwise, the different sequels displayed erratic performance. Objectively, Star Wars: Attack of the Clones made buckets of money, as it grossed $309 million. However, that fell far short of the $431 million take experienced by its predecessor, The Phantom Menace, so many regarded it as a disappointment. I think Harry Potter and the Chamber of Secrets will more closely match expectations, but it also will likely fall considerably short of its predecessor, Harry Potter and the Sorcerer’s Stone. As of December 10, 2002, Secrets has made about $217 million, which means it’ll clearly end up with a gross substantially below the $317 million of its predecessor. Still, sequels almost always make notably less money than the originals, so whatever gross Secrets ends up with, it’ll remain positive. And then we come to the disappointments. After its opening weekend, Analyze That looks like a bomb, as it made a mere $11 million during that span. Of course, it’s possible it might recover from that dismal beginning, but it seems unlikely. The only other major decline in performance came from Stuart Little 2. After the original nabbed a tidy $140 million, the sequel took in a fairly modest $64 million. That figure fell far short of the movie’s enormous budget and probably ensured that we won’t get a Stuart Little 3. After I watched Little 2, I can’t say I’ll bemoan that prospect. I rather liked the first film, as I felt it provided a sweet and charming little piece of work. While the sequel didn’t mar the memory of the original, it nonetheless came across like a fairly uninspired and forgettable tale. Though it specifics no time line, apparently Stuart Little 2 picks up about three years after the conclusion of the prior movie. In the interim, the Little family – which includes father Frederick (Hugh Laurie), mother Eleanor (Geena Davis), roughly 10-year-old son George (Jonathan Lipnicki) and adoptive rodent son Stuart (voiced by Michael J. Fox). Since the last flick, the brood added a daughter Martha (Anna and Ashley Hoelck), who now seems to be about two years old. At the start of the movie, we see that Eleanor seems rather overprotective of Stuart. He plays on a peewee soccer team, which scares her, especially when Stuart gets plastered to the ball during a game. Stuart feels alone, so Frederick advises him to find a new friend. This happens when tiny bird Margalo (voiced by Melanie Griffith) literally falls into his life. While under attack by a winged baddie called Falcon (voiced by James Woods), Stuart helps rescue the injured Margalo, and he takes her into the Little home to allow for her recuperation. Clearly Stuart starts to fall for Margalo, but unfortunately, she doesn’t present herself accurately. As the film progresses, issues will arise that relate to that, and Stuart experiences an existential crisis as he questions his worth as a Little. I won’t ruin the finale, but don’t be too shocked if the flick offers a happy ending. Stuart Little 2 provides one of those films that does everything in an inoffensive and mildly likable manner but that never quite connects. As a reviewer, this makes my task more difficult, as I find it tough to find anything about the flick that stood out as either strongly positive or negative. The movie maintains such a general bland affability that it inspires few emotions in either direction. Actually, the computer animation generates both good and bad elements. On one hand, they bring Stuart to life quite nicely and imbue the cartoon mouse with a surprising amount of emotion and feeling. The other totally CG-created critters fare less well. Falcon scoots in and out of the movie so rapidly that we never really get the chance to closely inspect the work, but Margalo comes across as a bit too cartoony and fake. Since she fills much less screen time than does Stuart, this doesn’t become a substantial problem, but Margalo fails to match up to the fine work performed for the lead character. Stuart works well in fairly close shots, but when the camera moves back, the images become less convincing. That doesn’t reflect the animation itself, however. Instead, I see concerns related to the manner in which Stuart and the other CG personalities blend with the live-action backgrounds and actors. They don’t quite mesh, which makes the lack of reality all the more obvious. At times, Little 2 feels like a series of set pieces to which they attached a loose story. As was the case in the first film, Stuart still feels like an outside; now that he has a family, he wants closer peer relationships, apparently. That “finding a friend” plot seems quite loose, however, as most of the movie comes across as a package of gimmicky sequences marginally connected together. We see Stuart in his car, Stuart in a plane, Stuart at a soccer game, Stuart on a skateboard, and so on. I get the feeling that the cart drove the horse here; the filmmakers created nifty action possibilities and went from there. That enables them to place Stuart in a lot of cute situations, but it doesn’t make the movie coherent and involving. Stuart Little 2 manages a few clever pieces, such as a shot of what happens to his tiny car when he abandons it. However, those moments seem few and far between, as the flick generally presents a mildly entertaining but generic and bland program. Fans of the original movie may find some enjoyable moments here, but I think they’ll be disappointed by the decline in quality from the original. 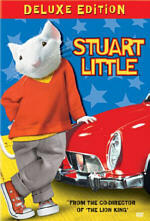 Stuart Little 2 appears in both an aspect ratio of approximately 1.85:1 and in a fullscreen version on this single-sided, double-layered DVD; the widescreen image has been enhanced for 16X9 televisions. Only the letterboxed picture was reviewed for this article. Despite a few small issues, Stuart generally provided a terrific image. Sharpness came across as solid for the most part. At times, some shots looked slightly soft, but those occurred infrequently. Most of the movie appeared crisp and detailed. I noticed no issues related to jagged edges or moiré effects, and I also detected no signs of edge enhancement. The movie also lacked any apparent indications of print flaws, as it consistently seemed clean and fresh. However, some graininess occurred; mostly those instances related to CG shots. The semi-fantasy setting of Stuart provided a vibrant location, and the DVD mainly replicated those tones well. The colors came across as bright and cartoony and really looked lively and distinctive. Black levels seemed reasonably deep and accurate, and shadow detail usually was clear and appropriately opaque. However, a few low-light scenes seemed a little dense; for example, one bedroom shot was somewhat thick. 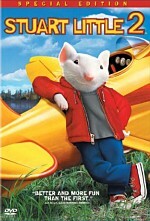 In the end, although I noticed a few minor concerns, Stuart Little 2 mostly presented a very positive picture. The Dolby Digital 5.1 soundtrack of Stuart Little 2 also worked well for the material. 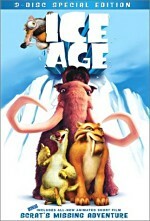 Most of the movie emphasized the forward spectrum and featured clean and compelling environmental elements. Those made the setting smooth and convincing, and the score also showed nice delineation and imaging. The surround speakers mostly reinforced those pieces, but the rears came to life terrifically during the movie’s more active sequences. For example, the scenes with the plane had the vehicle zoom neatly around the room, and the film’s climax came to life well. Audio quality seemed satisfying. Speech appeared natural and warm, and I noticed no issues related to intelligibility or edginess. The score sounded nicely dynamic and vivid, and I really liked the reproduction of those elements. However, the movie’s occasional pop songs showed too much emphasis on the mid-range, which made them sound a bit too thick and dense. Effects appeared crisp and detailed. They displayed no problems related to distortion and also presented reasonably tight and deep bass response. Ultimately, Stuart Little 2 offered a generally fine soundtrack. This DVD release of Stuart Little 2 packs a decent roster of supplements. We start with an audio commentary from director Rob Minkoff and senior visual effects supervisor Jerome Chen, both of whom sit together for this running, screen-specific piece. Due to the nature of the film and the qualifications of the participants, the track largely focuses on technical issues, and we get a fairly nice look at the myriad issues involved with the film. The pair keep the commentary from becoming too dry, as they give us a light and lively examination of a number of topics. In addition to the strictly technical considerations, we hear about things such as problems working with the twin toddlers, concerns related to the reshoot and Geena Davis’ pregnancy, story changes and evolution, and a few other subjects. Overall, the commentary seems generally intriguing and enjoyable. Next we find a branching feature called Show and Tell. Periodically, an icon shows up on screen; hit “enter” and you can watch short clips about the making of the film. After an explanatory audio introduction from Stuart at the start of flick, we get an additional 17 segments that pop up throughout the movie. These appear nicely spaced, so unlike similar features on other DVDs, we rarely go long without any clips; the largest gap takes about 10 minutes, but that size break only occurs twice, and often we see pauses of only a couple minutes. The segments cover a myriad of filmmaking subjects. With 17 featurettes, I won’t mention all of the topics, but these go through many issues related to the production process, from costuming Stuart to long-distance vocal recording to matte paintings to the creation of wind on feathers. The different segments last between 40 seconds and two minutes, 42 seconds for a total of 26 minutes, 30 seconds of footage. We hear from director Rob Minkoff, producers Lucy Fisher and Doug Wick, production designer Bill Brzeski, director of photography Stephen Poster, costume designer Mona May, animal trainer Boone Narr, supervising modeler Kevin Hudson, senior visual effects producer Michelle Murdocca, animation supervisor Tony Bancroft, animation supervisor Eric Armstrong, actors Hugh Laurie, Geena Davis, Melanie Griffith and James Woods, executive producer Jason Clark, lead animator Todd Wilderman, matte department supervisor Ivo Horvat, visual effects supervisor Jay Redd, lead animator Paul Jessel, senior technical director Rob Engle, feather technical directors Cherie Rye and Chris Yee, computer graphics supervisor Thomas Hollier, computer graphics supervisor Clara Chen, and storyboard artist Adolfo Perez. Some of the bits are duds, but most of them nicely illuminate the appropriate subjects. Taken as a whole, they provide some good information about the film’s creation. Two additional featurettes appear on the DVD. A Touch of Evil lasts seven minutes, 45 seconds and mixes shots from the movie with behind the scenes clips and interviews. We hear from actor James Woods, director Rob Minkoff, animation supervisors Eric Armstrong and Tony Bancroft, visual effects supervisor Jay Redd, animator Kenn McDonald, screenwriter Bruce Joel Rubin, supervising animator Chad Stewart, storyboard artist Adolfo Perez, technical director Bob Winter, and feather technical directors Chris Yee and Cherie Rye. Despite the program’s brevity, “Evil” offers a solid discussion of casting, design concerns, voice issues, and other technical elements. It gives us a positive look at the creation and execution of the character. For something unusual, check out Life In the Fast Lane. Entitled a “Zoom Through the Filmmaking Process”, this lasts 123 seconds and it really does fly through the production. We quickly watch movie clips and various behind the scenes elements as “Lane” zips through different sequences. Obviously, it provides absolutely no depth, but it seems fun. An interactive game called “Stuart’s Circle of Friends” appears after this. It requires you to “solve six riddles about your favorite Stuart Little 2 characters to create a whole new circle of friends”. Basically this offers a very simple multiple choice contest that concludes with no real reward for successful completion, unfortunately. Celine Dion appears in a Music Video for “I’m Alive”. The three-minute, 33-second piece provides the usual lip-synch/movie clip combo and offers nothing compelling visually. As for the song, it seems like fairly typical mush from the Bony One. Stuart Little 2: The Playstation Game gives us a promo for that product. It intercuts movie clips with shots from game and lets you check out seven different scenes either individually or as a whole view the “Play All” option; if you pick the latter, it’ll last three minutes, 23 seconds. The ad contributes nothing to the package, though I must note that I hope the game is for the PS1, not the PS2, as the graphics look simply atrocious. A few additional minor supplements round out the DVD. Filmographies includes basic entries for director Rob Minkoff, executive producers Jason Clark and Gail Lyon, producer Lucy Fisher, producer/story Douglas Wick, writer Bruce Joel Rubin, and actors Michael J. Fox, Geena Davis, Hugh Laurie, Jonathan Lipnicki, Nathan Lane, Melanie Griffith and James Woods. Located in a separate menu from the main screen, Theatrical Trailers presents ads for Stuart Little 2, The Master of Disguise, Columbia-Tristar’s “Family Fun” titles, Kermit’s Swamp Years, and Little Secrets. Folks with DVD-ROM drives will discover some materials. Like a feature found on Shrek, the “Revoice Studio” allows you to record your own takes of eight different movie scenes. I should accentuate that it allows you to record your own takes of eight different movie scenes; my microphone is buried underneath the wreckage that is my computer room, so I wasn’t able to try this segment. It sounds pretty cool, though. A similar program appears next via the “Revoice Read-Along”. This will let you record your own narration for the Read-Along story from the main DVD. Again, I couldn’t try it, but it seems like a fun addition. Along with links to stuartlittle.com and Columbia-Tristar Home Entertainment, the DVD-ROM area ends with a game demo for the “Roof Skate” portion of a PC release. It’s quite simple, but it offers some good graphics and a reasonably entertaining side-scroller. Too bad the vocal work comes from a Michael J. Fox imitator, albeit one who replicates Fox’s work pretty well. Though not a bad collection of extras, the package for Stuart Little 2 doesn’t compare with the very nice collection found for the first movie. I guess that’s what happens when a sequel makes less than half of its predecessor. Stuart Little 2 provides an unoffensive and sporadically pleasurable program, but it never offers anything very lively or winning. The DVD includes positive picture and sound along with a pretty decent roster of supplements. If you know that you like Stuart Little 2, then I can definitely recommend this DVD, but otherwise, this one might be a passable rental for fans of the original film.